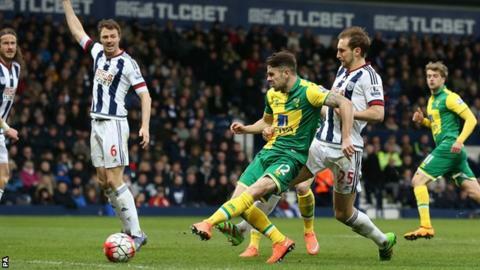 Norwich secured their first win in 11 league games to move out of the bottom three with victory at West Brom. After a turgid first half, Robbie Brady put the away side ahead with the game's only shot on target. West Brom went close through Claudio Yacob's first-half drive before Stephane Sessegnon wasted their best chance, firing wide from a tight angle. Norwich are now three points clear of the drop-zone in 17th, but will return to 18th if Sunderland win on Sunday. Sam Allardyce's side play local rivals Newcastle United, who are 19th, at St James' Park. West Brom, for whom this was a first home defeat since December, stay 11th. Just where did West Brom go? Tony Pulis's side had been on an impressive run, winning three of their last five - including a 1-0 home victory over Manchester United in their previous game. But that was two weeks ago, and the Baggies looked more than a little rusty here. Saido Berahino, Salomon Rondon and Sessegnon all wasted decent openings in the first half, each time shooting wildly when composure was required. Yacob fizzed an effort high and wide after John Ruddy clawed out a swirling corner but in the second half the opposition goalkeeper had almost nothing to do. The introduction of Rickie Lambert from the bench failed to spark a late rally from the home side, and even with six minutes of added time they finished with a whimper. The turning point for Norwich? This win ended a run of six consecutive defeats away from home for Norwich, and it couldn't have come at a better time. The Canaries didn't cover themselves in glory in the first half either, but after the break they began to look something more like side that picked up some impressive results earlier in the season. After the goal, Jonny Howson, Gary O'Neil, Brady and Matt Jarvis began to dominate in midfield and their play at the back was also much improved. The Canaries hadn't kept a clean sheet away from home in the league all season, but they never looked like being pegged back after Jarvis's miscue fell to Brady for a close-range finish. With only seven matches left to play, this was an important victory, but there are more vital games to come. Norwich host relegation rivals Newcastle after the international break, and Sunderland two weeks later. Now, and after holding Manchester city to a 0-0 draw last week, they'll feel a lot more optimistic about avoiding the drop. West Brom manager Tony Pulis: "It's disappointing. We were on such a good run and playing so well. I couldn't see it coming, they've trained well this week. "We're not good enough to be anything less than 11 players playing to their maximum. Today, I don't think there's a player who could say they hit any sort of form. "You have to give Norwich credit but if we don't play well and the opposition don't play well, I thought it had 0-0 written all over it. We didn't have a player who gave us a spark and the same for them." Norwich manager Alex Neil: "The boys performed well, we deserved to win. The frustrating thing is we've played well in the three or four games before and haven't picked up any points. "There haven't been enough breaks go our way recently. Today was a big result, and we've got a batch of another four big games coming up. "We need to take this momentum into those matches, we will fight tooth and nail to stay up." West Brom have to wait another two weeks before they play again, when they travel to Sunderland on 2 April. Norwich's next game is at home to Newcastle on the same day. Match ends, West Bromwich Albion 0, Norwich City 1. Second Half ends, West Bromwich Albion 0, Norwich City 1. Rickie Lambert (West Bromwich Albion) wins a free kick on the right wing. Substitution, Norwich City. Ivo Pinto replaces Matthew Jarvis. Corner, West Bromwich Albion. Conceded by Sebastien Bassong. Substitution, West Bromwich Albion. Rickie Lambert replaces Stéphane Sessegnon. Corner, Norwich City. Conceded by Claudio Yacob. Steven Naismith (Norwich City) wins a free kick in the defensive half. Vadis Odjidja-Ofoe (Norwich City) is shown the yellow card. Matthew Jarvis (Norwich City) wins a free kick in the attacking half. Substitution, Norwich City. Vadis Odjidja-Ofoe replaces Robbie Brady because of an injury. Delay in match Robbie Brady (Norwich City) because of an injury. Attempt missed. Craig Dawson (West Bromwich Albion) header from the centre of the box misses to the right. Assisted by James McClean with a cross. Alex Pritchard (West Bromwich Albion) wins a free kick in the defensive half. Substitution, West Bromwich Albion. Alex Pritchard replaces Craig Gardner. Substitution, Norwich City. Steven Naismith replaces Patrick Bamford. Attempt blocked. Craig Dawson (West Bromwich Albion) right footed shot from outside the box is blocked. Salomón Rondón (West Bromwich Albion) wins a free kick on the right wing.